Each garment is created with our own in house design team, made and manufactured in the UK. Worldwide Shipping. Using the finest fabrics from chiffons to lace we also specialize in Knitwear. Fashion-Book.com assures high quality standards are met, giving each garment a unique touch for all occasions, Day to Evening wear. 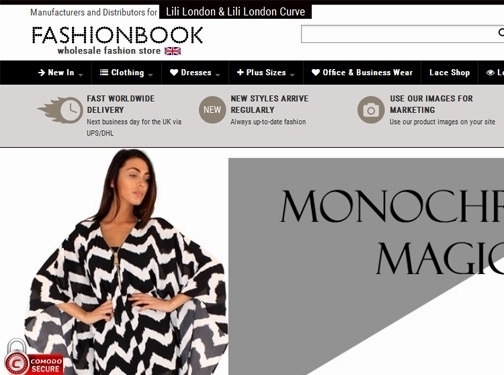 Fashion-Book.com is also dedicated to bring fashion not only for small sizes but also for plus size women in its curve range, who deserve to be as fashionable and look stunning in the key pieces designed for Women, who love their curves. UK (Leicester) based business - established in 1992 - providing wholesale women's clothing. Website includes e-commerce facilities (for members), delivery and returns information (via terms and conditions), associations, full contact details including VAT number.